Also known as The Common Murre it is a large Auk. A couple of amazing facts about this cute little bird. They have been known to travel 200 kilometres to find food for their chicks and can dive up to 100 meters for food! It spends its life at sea only coming to land to nest. It is dark brown and white and has a white ring around the eye and a stripe behind it. They eat fish and crustaceans. There are estimated to be 950,000 pairs in the uk. When leaving the nest the chicks can’t fly, they glide and as soon as they hit the water they are more than capable of diving. 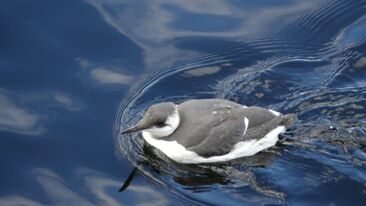 The Common Guillemot can reach speeds of 50 miles per hour in flight. They dive for around a minute and travel over 98 feet under water.